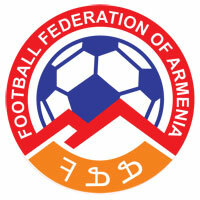 SportingArmenia.com ..... everything about Armenian sports. Azovmash Cup comes to a close with major gains by the Armenian Greco-Roman wrestling team. 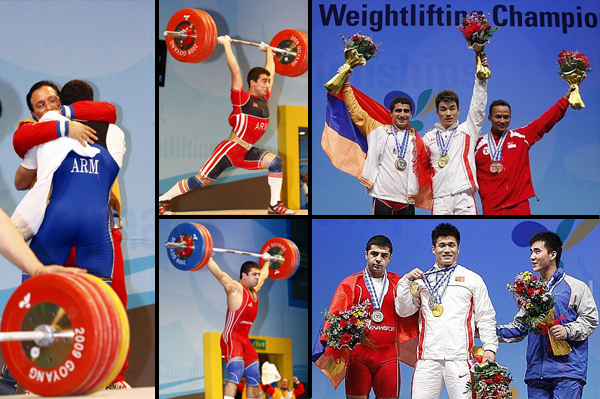 Of the seven weight categories, Armenia won Gold in three and was matched by the Iranian team who also won three Gold Medals. Team Armenian also won one Silver medal and two Bronze medals. At the European Cadet Championships the Armenian Greco-Roman team finishes the tournament with one Bronze medal to show. Although three others wrestled in the bronze medal match, only Lyudvig Kocharyan was successful in gaining the only medal for Team Armenian in the Greco-Roman style. Excellent start for the Armenian Greco-Roman team at the Azovmash Cup in Ukraine as all five Armenian wrestlers won medals on the first day of the tournament. Roman Amoyan (55kg) won the Bronze, Sasun Ghambaryan (66kg) won the Gold, and the Armenian wrestlers swept the 84kg category with a Gold for Artur Shahinyan, a Silver for Tigran Sahakyan, and a Bronze for Denis Forov. Teams from Russia, Kyrgyzstan, Kazakhstan, Uzbekistan, Turkey, Greece, France, Belarus, Moldova, Iran, Lithuania, Poland, Jordan and Ukraine are participating. Team Armenia finishes the European Youth Olympics Festival in Tampere, Finland with one Silver and one Bronze medal. Garik Harutyunyan won the Silver medal in the boys 55kg Judo event, while in the 73kg category Mher Tavalakyan won the Bronze. In the second leg of the UEFA Europa League matchup Gandzasar Kapan lost to NAC Breda of Holland by a 2-0 score for a 8-0 aggregate score and an exit from the tournament. One more bronze medal for Team Armenia to make it 3 Bronze and 1 Gold Medal total at the European Cadet Wrestling Championships. Excellent start for Team Armenia at the European Cadet Championships as they win one Gold and two Bronze medals on the first day of the tournament. Armenian champions Pyunik have lost to Dinamo Zagreb of Croatia by a 3-0 score in the 2nd leg of the UEFA Champions League matchup. Dinamo have progressed by an aggregate score of 3-0 after the 0-0 tie in Yerevan. Gandzasar Kapan embarassed by NAC Breda of Holland after taking a 1-0 deficit into halftime. NAC Breda scored three times within a 15 minute span after halftime to take a commanding 4-0 lead, and would finish with a 6-0 victory. Pyunik battles Dinamo Zagreb of Croatia to a 0-0 tie in the first leg of the Champions League qualifying round. The return leg will be on the 21st from Zagreb. 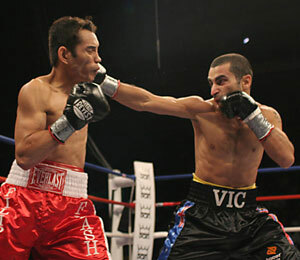 A disappointing day for Armenian boxers as both Vic Darchinyan and Khoren Gevor lost challenge fights to title opponents. Yura Movsisyan has transfered from Real Salt Lake of the MLS in the United States to FC Randers of Denmark on a new 3-year deal, to join Robert Arzumanyan of the Armenian national team. Banants defeates Siroki Brijeg of Bosnia 1-0 in the second leg of the Europa league match, but it's not enough to advance as the Serbs had defeated Banants 2-0 in Armenia. MIKA tie IF Helsingborg of Sweden 1-1 in the second leg of the UEFA Europa League qualifying round, thereby getting eliminated by a 4-1 aggregate score. Armenian Greco-Roman team disappointed with no medals although they had three wrestlers fight for the bronze medal on day 2. Susi Kentikian (now 26-0, 16KO) has won her title defense bout over CAroline Marcela Gutierrez Gaite by a 10 round Unanimous Decision 100-90. Aleco Eskandarian has been traded to the Los Angeles Galaxy. MIKA loses a 1-1 tie late in 2nd half as Helsingborg scores in the 86th and 92nd minutes for a 3-1 victory. Banants loses to Siroki Brijeg of Bosnia-Herzegovina in the first leg of the UEFA Europa League by a score of 2-0. Armenian junior team wins a Bronze at the European Junior Wrestling Championships in Tbilisi, Georgia.